I am suffering from progressive intermittent Theralite Envy (TE), a recently-recognized condition amongst American clinicians who treat a lot of myeloma patients but do not have ready access to the Gambro HCO 1100 dialyzer filter. The cause of TE can be debated, but my case was definitely exacerbated by recently admitting a myeloma patient with severe acute kidney injury from cast nephropathy which did not improve despite prompt recognition of the problem and initiation of effective systemic myeloma therapy. Several years ago, a consulting physician once assured me that plasmapheresis could cure my TE, but its really only made it worse (see why). The Gambro HCO ("high cut-off") 1100 dialyzer is distinct for its 15-60 nm pore size, permitting passage of molecules with a MW of up to 45 Daltons (the size of a dimeric lambda light chain). 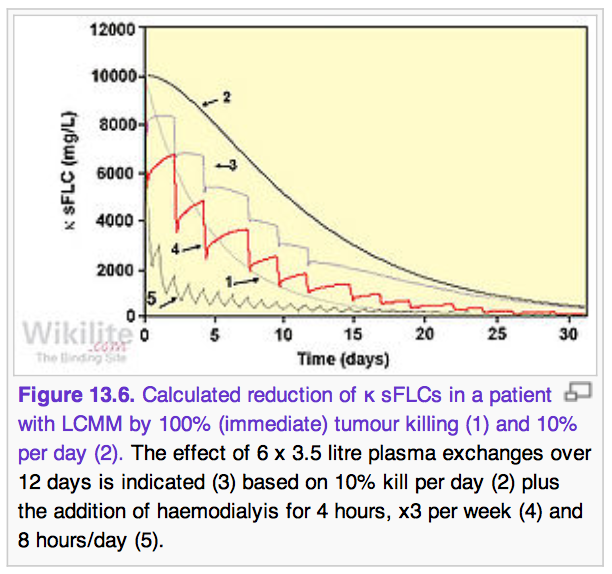 The figure above models clearance of light chains from the serum with plasma exchange and HCO hemodialysis. Randomized studies - EuLITE and MYRE - have been ongoing (and ongoing, and ongoing...) in Europe. 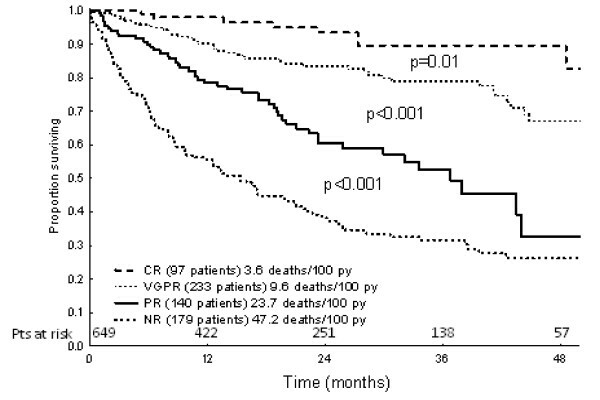 In both studies, myeloma patients with renal injury who are being treated with bortezomib-based therapy will be randomized to either HCO dialysis with the Gambro filter, or to conventional high flux hemodialysis. The EuLITE trial was initiated 5 years ago, and results are expected this year. 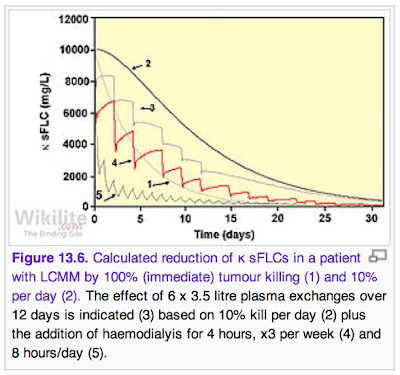 Since the best novel agent combination regimens for AL amyloidosis typically take over a month to induce maximal light chain suppression, its reasonable to explore HCO dialysis as an adjunctive therapy, either in the initial stages of treatment, or as an ongoing part of care. Dr. Giampaolo Merlini, a world-reknowned amyloidosis specialist from Pavia, Italy is currently conducting a trial using the Gambro filter in AL amyloidosis patients with amyloid heart disease and end-stage kidney injury. 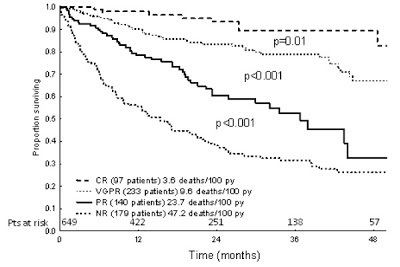 In this small study, it may be hard to prove what HCO hemodialysis adds to systemic therapy in terms of light chain reduction, let alone what it adds to the likelihood of inducing an organ response. Dialyzing away the main serum marker used in chemotherapy response assessment may also present a difficulty - particularly when trying to determine the likely benefit of ongoing chemo. At this point, as a sufferer of chronic TE, my prognosis remains guarded: it feels like we have waited an eternity for the results of large and small European trials examining whether use of the Gambro HCO 1100 dialyzer will have real utility in patients with plasma cell diseases. News may come this year. Negative results would probably relieve me of my longstanding TE, but would also certainly be a disappointment for the myeloma/amyloidosis medical and patient community. The needed prescription then for both patients suffering from light chain mediated kidney and organ disease, as well as clinicians and researchers suffering from TE? Positive results leading to accelerated availability of the filter on this side of the Atlantic. Fingers crossed. Have the results of these studies been published? Is your TE alleviated?